I’ve never been a fan of haunted houses. Why would anyone pay good money just to have the bejeezus scared out of them? Ghosts. Cobwebs. Creaking doors. Bats. Blood and guts. Bowls full of “brains.” Screams and moans. People jumping out to grab you. Thanks but no thanks. I can manufacture my own bad dreams without those things to help me along. Last spring, while on a business trip to Philadelphia, I toured the historic Eastern State Penitentiary. 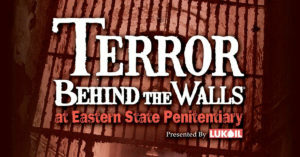 I didn’t know until I got there that it’s the site of “Terror Behind the Walls,” one of the most popular haunted house extravaganzas in the United States. Thank goodness it wasn’t “done up” for Halloween when I was there. Now a national historic landmark, the penitentiary opened in 1829. Its soaring, castle-like design, with seven wings of individual cellblocks radiating from a central hub, was an architectural wonder. The prison had central heat, running water and flush toilets before even the White House did. But what really set Eastern State Penitentiary apart from earlier prisons was its new and radical philosophy about how incarcerated people should be treated. Rather than punishing lawbreakers by confining them in miserable and dangerous conditions, Eastern State instituted a Quaker-inspired belief that a prison should be a “house of repentance” where prisoners could meditate on their crimes, experience spiritual remorse and undergo rehabilitation. These lofty goals were to be accomplished through strict isolation. Inmates lived alone in cells which adjoined private outdoor exercise areas. Guards passed food and other necessities through a small window in the cell’s door. Each inmate was given a Bible, though most were illiterate, and materials that allowed them to perform tasks such as weaving and shoemaking. Should an inmate need to leave his cell, he was required to wear a hood with no holes to lessen the possibility of making eye contact with others or formulating a plan of escape. More than 300 prisons throughout the world adopted the “forward thinking” Eastern State Penitentiary model. But modern criminology studies have determined that placing lawbreakers in solitary confinement for long periods of time rarely makes them reflective and penitent. Instead, it drives them insane. The isolation practices at Eastern State were abandoned in 1913. Prisoners began to share cells, eat and work together and even play organized sports. The prison was closed in 1971 and soon fell into ruin. Twenty years later, because of its historical significance, a cry went up to save it for posterity. Though restoring the entire prison was cost prohibitive, enough of it was reclaimed to give visitors an unforgettable glimpse into its past. And to host those who believe that a great way to celebrate Halloween is to do it within the prison walls. I’m not among their ranks. Today’s fake horrors can’t begin to compare to what it must have been like to live, sometimes for years, all by yourself.